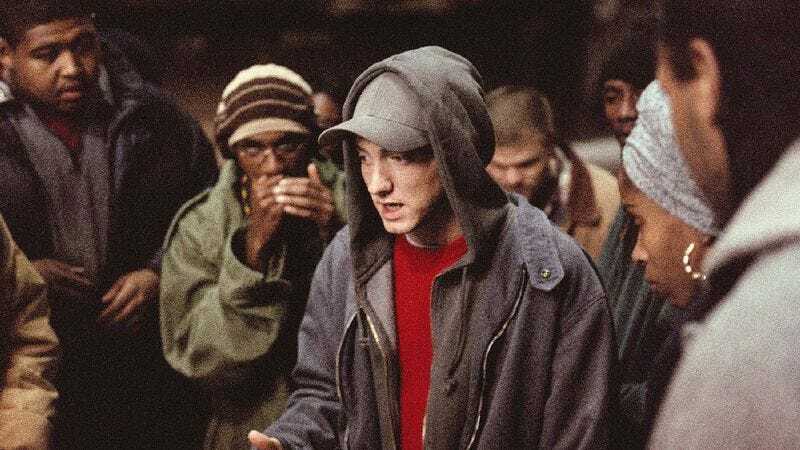 What with the chart success of Recovery and its recent sweep of the Grammy nominations proving the old adage we just made up that “Eminem is cyclical,” it’s time for the erstwhile Marshall Mathers to finally deliver on the promise he showed in 8 Mile by tackling another acting job. Deadline reports that he’s teaming up with similarly quarrelsome Sons Of Anarchy creator Kurt Sutter for Southpaw, a boxing drama where Eminem would play a fighter who climbed his way to the top, only to stumble and find himself forced to recapture his faded glory. NOTE THEMATIC PARALLELS, BEEP BOOP. “In a way, this is a continuation of the 8 Mile story, but rather than a literal biography, we are doing a metaphorical narrative of the second chapter of his life. He'll play a world champion boxer who really hits a hard bottom, and has to fight to win back his life for his young daughter. At its core, this is a retelling of his struggles over the last five years of his life, using the boxing analogy. I love that the title refers to Marshall being a lefty, which is to boxing what a white rapper is to hip-hop; dangerous, unwanted and completely unorthodox. It's a much harder road for a southpaw than a right handed boxer." Yeah, especially when all the right-handed boxers accuse you of stealing their sport from them, just like you stole everything else. Anyway, all of our delightful jests and japes aside, this actually has the potential to be quite good, considering 8 Mile is essentially a hip-hop version of Rocky.